In order to create to record any form of music, it is important to understand step by step how to get from the planning, and playing of a track, to the end result of a completed recording. In contemporary music production, it is much easier than ever to make your own studio recording, though there options to be considered when setting out to record contemporary audio, it’s important to know what you would like to create, in order to find the most suitable hardware. By the end of this guide, you should be armed more with knowledge on the following topics. 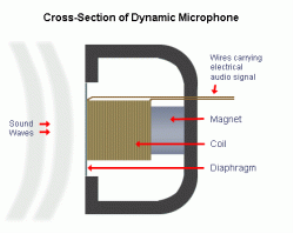 Microphones record an audio signal using sound pressure, which generates an electrically charged signal, this signal is then converted into digital so that it can be interpreted by a computer, a process known as Analogue to Digital Conversion (ADC), which is then converted into sound that can playback through the speakers of your computer using Digital to Analogue Conversion (DAC). Condenser microphones store energy in the form of an electrostatic field, which uses a capacitor to convert analogue energy, and stores it as digital energy (capacitance). 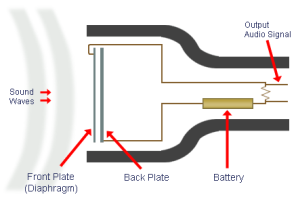 In the image below, you can see the cross section of the inside of a condenser mic. On the front we have two plates, the front plate (or ‘diaphragm’) and the back plate. The diaphragm vibrates in response to sound waves, changing the distance between the two plates. The closer the diaphragm is to the back plate, the higher the capacitance, creating a charge which is passed through and amplified. Due to the diaphragm, condenser mics are more sensitive to higher frequencies. Known to be great for recording vocals. Dynamic microphones are an all-round choice suited for most purposes. Simple in structure, and resilient to rough treatment and for handling high levels of volume. A charge is generated via kinetic movement between the coil and magnet. What are the key differences between these two microphones? Condenser microphones tend to be more sensitive, better at recording high frequencies, whereas dynamic microphones not normally have the same flat frequency response, and tend to be purpose made for certain applications. Dynamic mics are durable and cheaper, condenser mics tend to be more expensive, much less durable. A microphones polar pattern is the space surrounding the outside of the microphone that picks up audio. Some microphones have several in one mic, one such example being Blue Microphone’s “Yeti” . The polar pattern can determine the feel, ambience, and colour of the recorded audio. The most common microphone pattern is the cardioid mic. These typically have a 120 degree range to pick up audio. Good for speech for podcasts with a rich, full-bodied sound. Cardioid mics are good for rejecting sounds from other sources/directions. Similar to the cardioid microphone, the Hypercardioid has a tight pick-up range of 100 degrees, they are better at rejecting sounds from the sides, though pick-up a little bit of sound from the rear. Due to the design of these microphones, feedback is reduced, making them a good choice for recording quieter vocalists. Figure of Eight (or bi-directional) microphone. These are used to record a more natural sound quality, product of it having pick-up from both the front and rear, rejecting audio from the sides. It doesn’t respond to sound pressure, only the change in pressure between the front and back. A common use for bi-direction mics is for interviewing, or for radio. 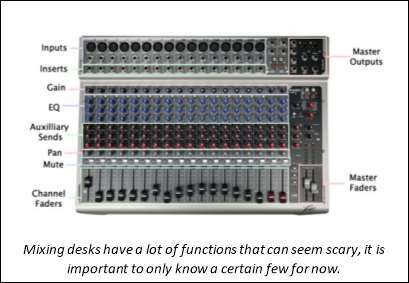 The mixing desk is a device for combining several sound source, while being able to interact with them individually. A mixers main task is to mix down several tracks into a stereo track, combining sound from several sources to produce an acceptable balance and quality track. On the back of the desk, we have the inputs, where you would connect your microphone. Microphones connect to the desk using an XLR cable, if you are using an external sound card you might be more likely to use a line-in port. In order for sound to be stored onto a computer, that analogue energy generated from a microphone needs to be converted into digital using an ADC such as an audio adapter, or sound card, then converted back to analogue using DAC via a sound card for example, which then plays back through the speakers, allowing you to hear changes made via the mixing desk, and hear that in real time. A pre-amp may also be used to boost the signal strength without degrading the quality to noise (hissing) ratio much. Channel inputs receive this audio, which is manipulated via the desk, or DAW. The channel faders are used to change audio levels, mute cuts the audio from being received from a channel, pan changes how far to the left, or right a channel’s output audio plays back, there is also equalisation (EQ), which involves diminishing and boosting certain frequencies. There are many other ways to manipulate audio, though what’s important is that you understand how audio is recorded, and the components involved. Now that we have gone into detail about various microphones, features and how to connect that up to record audio, you should be armed with a better understanding what to look for when planning your first music production project. Please look into the sources below as well for further insight. "Processes and Components of a Studio Recording." UKEssays.com. 11 2018. All Answers Ltd. 04 2019 <https://www.ukessays.com/essays/music/processes-components-studio-recording-5035.php?vref=1>. "Processes and Components of a Studio Recording." All Answers Ltd. ukessays.com, November 2018. Web. 25 April 2019. <https://www.ukessays.com/essays/music/processes-components-studio-recording-5035.php?vref=1>. UKEssays. November 2018. Processes and Components of a Studio Recording. [online]. Available from: https://www.ukessays.com/essays/music/processes-components-studio-recording-5035.php?vref=1 [Accessed 25 April 2019]. UKEssays. Processes and Components of a Studio Recording [Internet]. November 2018. [Accessed 25 April 2019]; Available from: https://www.ukessays.com/essays/music/processes-components-studio-recording-5035.php?vref=1.